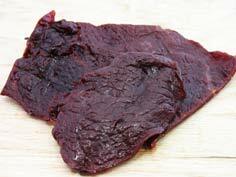 Download Beef Jerky Recipes eBook Now! Put steak in freezer for about half an hour, just until firm. Slice steak across grain, about 1/4 inch thick. Mix all ingredients together with the exception of the strips. Allow the ingredients at least 15 minutes for flavors to blend. Add strips. Marinate at least one hour. For longer time, place in the refrigerator in a covered container or an air-tight plastic bag. Remove from marinade and place in your dehydrator until dry. **Click here for our PREPARATION PAGE for more in depth directions. Get more recipes like this for FREE! Do you want more recipes like this? Download our Beef Jerky Recipes ebook while it's FREE! But hurry...it's only free for a limited time! I throughly enjoyed this recipe. I did not have any venison, so I subsitute it with beef and tasted great. I sent it to our troops in Iraq in their Christmas boxes. I am sure they enjoyed. I am currently experimenting with this recipe adding ground fennl seed. It is currently in the marinating phase and will be in the dryer tonight. Thanks for sharing this great recipe! Merry Christmas and a Happy New Year! We want to hear about your experiences with our Jerky Recipes! Please leave your comments on any recipe and help other jerky makers be successful. If you decide to buy Beef Jerky online, check out Jerky.com!